We would like to gather detailed information on the areas where Greenshanks are sighted, including photographs, useful websites and contact information. If you would like to help, please contact us. Chichester Harbour is one of the most important recreational boating areas on the south coast of England. There are some fifteen settlements around its 50-mile shoreline, each with its own characteristics and historical background. Farming and fishing are important local economic activities. The area is also important for recreation, attracting walkers, birdwatchers, painters, photographers, cyclists and wildfowlers. The Harbour is a special place for wildlife, and is internationally recognised for birds and for its coastal habitats. These include mudflats, saltmarsh, sand, shingle and freshwater marshes. These habitats support a huge variety of plants and animals, especially estuarine birds, notably geese, ducks and waders. It is an Area of Outstanding Natural Beauty (AONB), and together with Langstone Harbour it is a European “Special Protection Area” (SPA), designated for its international importance to breeding, migratory and wintering birds. Chichester Harbour Conservancy manages the harbour for recreation, leisure, nature conservation and its natural beauty. 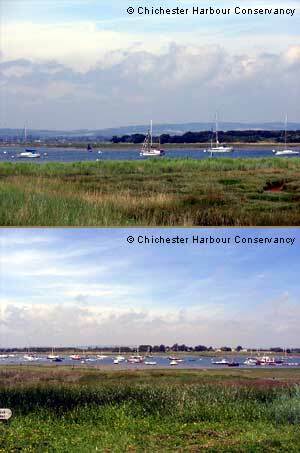 Visit the Conservancy’s website at www.conservancy.co.uk to find out more about Chichester Harbour. http://www.chichester.gov.uk - The online service for Chichester District Council. http://www.chichesterweb.co.uk - The Chichester Guide for visitors, residents and the business community. http://www.chiobserver.co.uk - Local news and information from the Chichester Observer. Anne de Potier is the project coordinator. Peter Potts is Chair of the Farlington Ringing Group. This is the area regularly visited by YR OY in winter. This bird was seen in several places, and the local birdwatchers looked out for it every autumn. One of them, Raymond Pavec, runs a website about the birds of the area. Site description: The river Guadalhorce flows approxiamtely NE and at the point of observation is about 30 m wide, although the actual water flow channels are probably not more than 40-50'% of the total width and in most places are either more or less stagnant or very slow flowing at the time of the observation. The flow and width increases after rains. There is ample low vegetation with a height of up to 30 cms around the water edge and on islets with pathes of bare light gravel and these are widely frequented by small numbers of waders, herons and egrets, plus the occasional Sacred Ibis (escapees) and African Spoonbill. 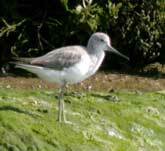 Greenshanks are both a migrant and wintering species at this site. Autumn migrants appear from late July onwards. Passage is well spread out but seems to peak in mid September to mid-October when there may be up to 5-6 birds at the Guadalhorce ponds at the reserve on the coast just west of Malaga. Spring migration is less marked and more rapid, occuring between late February and May. Thanks to Andy Paterson and Angel Garcia Lopez for providing this information. Langstone Harbour is the centre of three linked harbours on Hampshire's southeast coast, between Portsmouth Harbour to the west and Chichester Harbour to the east. The harbour is important for its environmental designations, and supports commercial shipping, fishing and recreational boating. The Harbour is managed by the Langstone Harbour Board, established through the Pier and Harbour Order (Langstone Harbour) Confirmation Act, 1962. Langstone Harbour is an internationally important wildlife site and an area of wilderness alongside a major city. Food-rich mudflats and saltmarsh support large numbers of wading birds and wildfowl and rare seabirds nest on its islands. The harbour is rich in marine life, with pontoon pilings and mooring chains covered in a seaweeds and animals. Reefs of native oysters provide a home for sea squirts, hydroids and sponges. The worms, crustaceans and molluscs that provide food for the birds also sustain the food chain below the waves. The shallow waters are rich in plankton and are an important nursery area for young fish. In the summer months, cuttlefish are found hunting and nesting among the weeds and eelgrass. Seals are sometimes seen in the Harbour, attracted by the abundance of food. A small fleet of local fishing boats harvest fish, oysters and cuttlefish depending on the season, and many anglers fish from the shore. To find out more, visit the Langstone Harbour Board website at www.langstoneharbour.org.uk. http://www.portsmouthcc.gov.uk - Portsmouth City Council is the authority for the western part of the harbour. 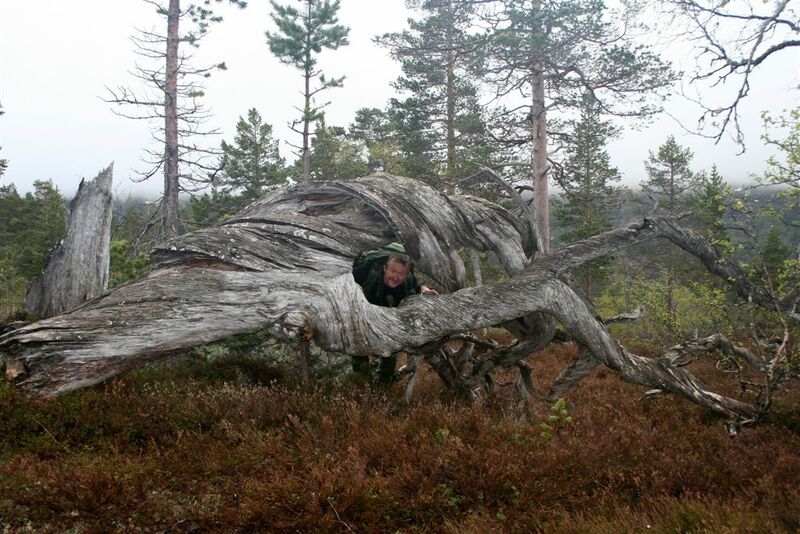 This site is a protected area in Norway. The habitat used by Greenshanks is described by ranger Peter Hermansen as 'mires and ponds/small lakes, groups of old pine trees, about 750 m above sea level'. The Ringing Group based at Stanny House Farm, Iken, Suffolk has caught over 30 Greenshanks at their site by the Alde Estuary. They use mist nets. Their birds have a green ring as the lower of the two on the right leg. They work in partnership with the Farlington Ringing Group, as they do with Black-tailed Godwits. They have caught and marked over 100 of those. The image shows a series of lagoons and islands created by the Stanny Environment Group to attract migrant waders on their journey through the site on their way north to their breeding sites. The Tagus estuary supports vast numbers of waders in its huge areas of mudflat and saltmarsh. Parts of the estuary are urbanised or industrial, and other parts are wild and natural. Birds also make use of the artificial ’salinas’, built for the salt making industry. These are groups of rectangular pools which have different depths of water according to the particular stage in the salt making process. The majority have been abandoned for decades and, being quieter, are often good for birds. However those adjacent to the estuary with eroding banks are likely to become intertidal again. Some salinas are now used as fish and shrimp farms; these are unsuitable for waders. FRG has developed a great professional and social partnership with Portuguese ornithologists in the Lisbon area. The image shows a salina at Samouco on the south side of the Tagus estuary. Photo by Afonso Rocha. http://www.birdlife.org/datazone/sites/index.html?action=SitHTMDetails.asp&sid=370&m=0 - For more information on the birds of the Tagus Estuary visit this Birdlife site. The Wash Wader Ringing Group http://wwrg.org.uk/new/?q=node/92 , and on Facebook, is a very active group. They catch Greenshanks as part of their busy programme of cannon netting and mist netting. Whilst we rarely see Wash birds on the south coast, the pooled data all help to build our understanding of Greenshanks in the UK and overseas. Greenshank have been colour-ringed by Grampian Ringing Group on the Ythan Estuary, near Aberdeen in NE Scotland, since 2003. Nearly all are juveniles on autumn passage. The Ythan Estuary is in a rural area. Habitats include grassland, wetland, farmland and a renowned dune system. 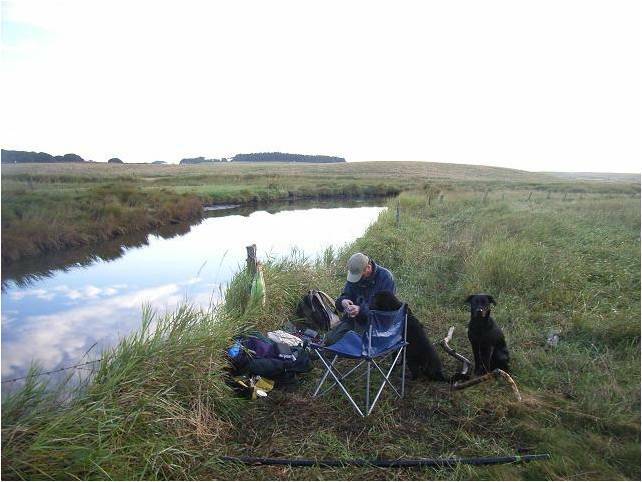 The birds are caught at dusk or dawn using a mist net over a narrow channel called the Tarty Burn. In 2003, a bird ringed on the Ythan in Early August was reported a month later by WJ Stone in Chew Valley, near Bristol. In 2005, a juvenile ringed on the Ythan in 2003 was resighted in early July by David and Pat Wileman at Cley in Norfolk, while two birds ringed in late August were reported together by Pablo Fernandez Garcia at Rio del Eo in Northern Spain, both remaining there for over a month. In 2006 Pablo resighted one of these birds back at the same site in July and August. Also in early August a birds ringed on the Ythan two weeks previously was reported by Aurelien Audevard and François Quenot on Ouessant Island in NW France. One of the aims of the project is to determine the number, stopover duration and turnover of Greenshank using the Ythan estuary. The 2006 movement to France demonstrates how quickly some individuals pass through. Interestingly, another bird ringed on the same night was still on the Ythan around the time the bird turned up in France. Likewise in 2003, a bird ringed on the same night as the Chew Valley bird was still in NE Scotland 33 days later, around the same time as the Bristol sighting. Some individuals, however, can remain on the Ythan for several weeks. WL+OB held the record in 2004, being resighted 8 times in 23 days, but LL+OB beat this by one day in 2005 with 7 sightings in 24 days. Raymond's birds have a blue ring on the right tibia, below another ring.